I liked it for the same reason, have a couple beers without much effect. I wonder what they are going to do at the State Parks where alcohol is illegal but 3.2 beer was allowed, especially when boating. Can't y'all just drive up to Nebraska to get 3.2? I think Oklahoma is too far south for you guys. Actually I am in the Wichita area so Oklahoma would be nearer but they only have 5% last I heard. Someone told me the breweries were phasing out all 3.2% beer because Kansas was one of the last to sell it. Of course that was second hand info. I don't know what they have in Nebraska. When I first moved here to buy on Sunday meant a 40-mile trip north. The county I live in was dry. Liquor laws here are confusing, but I am adjusting well, an ice cube in the drink isn't all that bad. I kinda feel for you guys, but Colorado is phasing 3.2 out, as well. 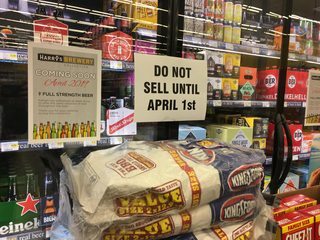 Does that law only apply to beer and mean you don't have any wine or spirits on sale? Just like English Beer, then, Hmmm? As for 3.2, most states have had laws that 3.2 beer was generally available, and anything higher could be sold only by liquor dealers. I never much liked the taste of 3.2 beers. Something about making love in a canoe comes to mind. As you get older you taste buds change a(I'm sure I read that somewhere) and sweet things like low alcohol beer don't taste as good and bitter thiongs become better tasting - why brussel sprouts and cabbage tastes bitter if you are a kid and OK if you are adult. I agree with you about english beer I don't like it either on the other hand german beer is really good. The drink culture when you got blootered as a matter of course used to be really string took a lot of nerve to refuse to drink on a night out.